Astronomers are using these three Hubble telescope images of nearby galaxies to help tackle the question of why their distant relatives have such odd shapes, appearing markedly different from the typical "ellipticals" and "spirals" seen in the nearby universe. By viewing these galaxies in ultraviolet light, astronomers can compare their shapes with those of their distant relatives. The results of their survey support the idea that astronomers are detecting the "tip of the iceberg" of very distant galaxies. Based on these Hubble ultraviolet images, not all the faraway galaxies necessarily possess intrinsically odd shapes. The spiral galaxy at far left, NGC 3310, shows young and old stars evenly distributed throughout the central region. If this were the case with most galaxies, astronomers would be able to recognize faraway galaxies fairly easily. In most galaxies, however, the stars are segregated by age, making classifying the distant ones more difficult. The middle image is an example of a tiny, youthful spiral galaxy. ESO 418-008 is representative of the myriad of dwarf galaxies astronomers have seen in deep surveys. These galaxies are much smaller than typical ones like our Milky Way. In this galaxy, the population of stars is more strongly segregated by age. The older stars [red] reside in the center; the younger [blue], in the developing spiral arms. 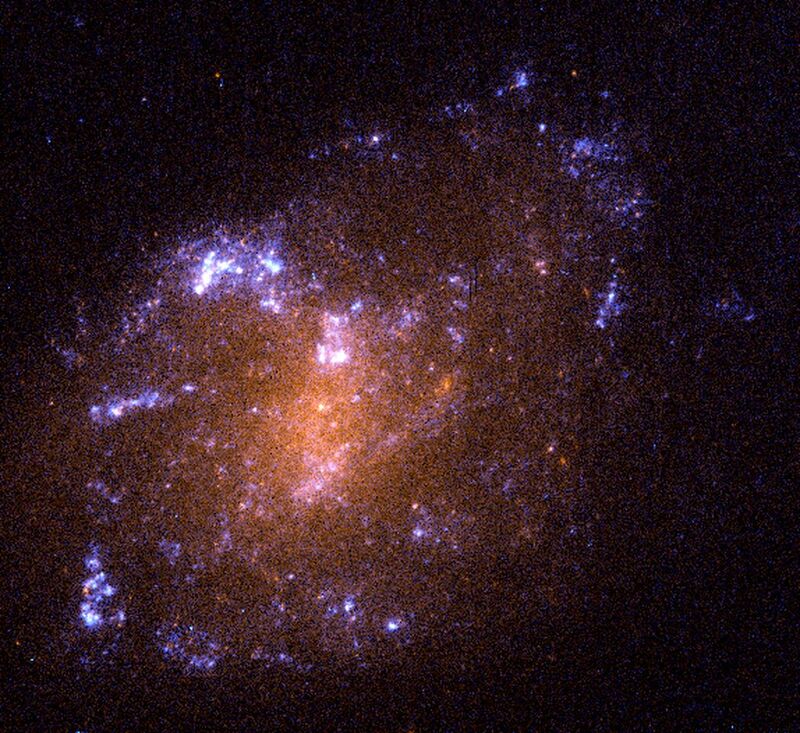 The picture at right shows a cosmic collision between two galaxies, UGC 06471 and UGC 06472. These collisions occurred frequently in the early universe, producing galaxies of unusual shapes. The Hubble telescope has spied many such galaxies in the deep field surveys. Galaxies emit all kinds of light, from visible to infrared. From this light, astronomers get a clear picture of what these galaxies look like. But distant galaxies pose a special problem. Light from these galaxies travels great distances (billions of light-years) to reach Earth. During its journey, the light is "stretched" due to the expansion of space. As a result, the light is no longer visible, but has been shifted to the infrared where present instruments are less sensitive. About the only light astronomers can see comes from regions where hot, young stars reside. These stars emit mostly ultraviolet light. But this light is stretched, appearing as visible light by the time it reaches Earth. Studying these distant galaxies is like trying to put together a puzzle with some of the pieces missing. So, astronomers are studying nearby galaxies in ultraviolet light to compare their shapes with those of their distant relatives.